One Pretty Little Box: Motivation Monday: Making time for the important things in life! Motivation Monday: Making time for the important things in life! Hello! It is finally September and with that returns more regular blogging on my part. Nine times out of ten it will NOT correspond with a video I do on YouTube ~ so let's just consider this blog a place to share things that I don't get around to showing on videos! Since I have been gone, the twins have started their first year of high-school (along with a season of football), and our daughter has started her senior year with her last year on the drill team. Needless to say Football has taken over our free time lately! At work, I moved up to next "grade" level from the older three's to the older PreKers and that transition has been beautiful! I work a pretty conservative schedule to accommodate the kids practice schedules and I am honored to be able to do that. We have gained a new family member in the process of the return to school. She is a full blooded German Shepherd and comes from good and clean stock. 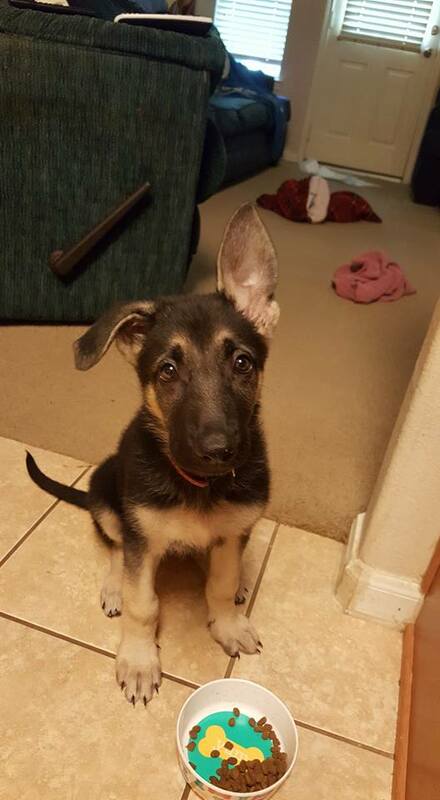 She is now 11 weeks (10 weeks in the pic above) and is working on allowing her ears to pop up! As you can see she is 1/2 way there. She is an inside beauty, so we are in the process of housebreaking which is going great! On the days I get off early, I rush home to pick up whatever discoveries she has found (which has been pretty much eliminated besides her toys) and to allow her time to go out to potty and play. I have been behind on YouTube videos though that is all getting back on a regular schedule as well. But I get frustrated when I am doing all these things and I hear people who stay at home all day say they have no time to do anything. Uhm, what are you doing with your time? I mean I get it .... if I don't have a focus, I can waste a ton of time myself. In fact the last two days I layed around the house. I can tell you though I needed it. I go from 3:45 am until about 10pm non stop. I wrote and published a book over the summer break and having that focus kept me going as well as much deep cleaning throughout our home. I am going to spend a bit of time this week contacting various people about #mydirtylittlesecret and hoping to get some publicity out of the deal ~ and being real with the world sharing my own story of being a secret keeper and how I have broke free. I have also been bitten once again by the writing bug! So, besides being a mom, wife, home keeper, I also work outside the home, pick up/take to practice, cheerleader on Thursday and Friday nights, along with whatever else comes my way. Stop saying you dont' have time if you haven't stretched yourself to simply do what needs to be done and still tackle something on your WANT to do list. So my motivation for you this Monday is get up and make time for the important things in life! Stop living on the excuses that there is not enough time and prioritize your day a bit better.